Looks like the pistols are out of ammo. Time to get automatic. "I have more bullets, you know. You gotta stop doing that!" "I know. It just looks so cool." The habit of characters in action shows to simply throw away guns when they run out of ammunition during a gunfight. Even the poorest of combatants will dispose of a gun by dumping it as soon as it goes dry. The logic seems to be that it is more important to maintain a steady rate of fire than it is to conserve resources such as weapons. Of course, the gun will also get tossed away if it happens to jam, because in Hollywood there's no way to fix that. This trope is to be expected when the weapons a character is using only have a single shot and/or take quite a long time to reload (such as crossbows and flintlock pistols), especially in Period Pieces set in eras that came before the invention of automatic and semi-automatic weapons that can be reloaded much faster. In real life this trope is sometimes called the New York Reload, and was once a common tactic with policemen, who would carry two revolvers to compensate for the limited number of shots and slow reload of their main service weapon. May overlap with Trench Coat Warfare for additional awesome. Compare and contrast Throwing Your Gun at the Enemy, where the purpose is as a last-ditch attack. For melee weapons counterpart, see Detachable Blades. Meryl Strife of Trigun does this to an extreme, with dozens of one-shot derringer pistols lining her cloak, which she'd go through quite rapidly in a gunfight. On occasion, Wolfwood was also shown using a large supply of pistols taken from the crossbar of his Cross Punisher, tossing each away when they ran out to grab a new one. Comically, after a barrage of derringer shots, Milly is seen picking up all of Meryl's discarded guns. Barnett of Vandread does this to at least five different weapons of the course of an episode, since she does have to keep firing constantly, or risk being overrun. However, as the end of the episode she gets very cheesed off that she can't recover the weapons, since they're incredibly rare in this time period. In the original Mobile Suit Gundam, Amuro had a tendency to toss away the beam rifle when it expended its ammo, but this is justified since it could only be recharged on the ship. In later series, smaller, magazine-style energy packs for the beam rifles are introduced allowing them to be reloaded on the fly & this trope becomes much less prevalent. Mobile Suit Gundam 0080: War in the Pocket features the Kämpfer, an assault-type mobile suit and the very definition of Glass Cannon. In order to keep its overall weight down, it carries a pair of shotguns and a pair of bazookas, all of which are Throw Away Guns; once these are expended, all it has left are its beam sabers and head vulcans. Mobile Suit Gundam Wing has the Wing Gundam and Gundam Heavyarms, both of whose main guns (the buster rifle and beam Gatling respectively) have no means of being reloaded and occasionally get ditched in order to reduce weight. It's noted in the case of Heavyarms that Trowa doesn't modify the Gundam's balance for the weapon (or something to that effect), so when he drops the beam Gatling he gets a a massive speed boost. When Heero has to use Heavyarms during his duel with Zechs, Trowa installs a hidden beam saber in the left arm in place of the small combat knife it normally carries, which was revealed when the Gatling was jettisoned. In Digimon Frontier, MagnaGarurumon throws his BFG when its out of ammo to bring out its lightsabers. Golgo 13 does this on occasion, mainly because if he gets rid of the gun he just used to kill somebody (in a way that the gun can't be found later), there's one less piece of evidence that can be used to prove he was the killer. And given that he charges seven figure fees for his services, he can afford to discard his old guns and buy new ones (with his preferred rifle only costing in the low four digits in reality) whenever he wants to. Puella Magi Madoka Magica: Both Homura and Mami fight by magically summoning a massive amount of guns, firing them and throwing them away. More justified with Mami who only conjures single-shot rifles. Oddly enough, Homura is shown stealing ammo but is never seen reloading her guns in the series. In Gotham Central, Detective Romy Chandler blames Batman for the death of her partner, Detective Nate Patton. When she and her new partner stumble upon Batman interrogating the Penguin, she draws her gun and fires. Batman survives, but he takes her gun and vanishes from the room. Reality Ensues as the fact that a police officer has lost her gun, after shooting Batman on top of everything, becomes a matter of great concern for her and the police department at large, especially when another detective slips and accidentally mentions the theft to their captain. Thankfully, before it can spin too far out of control Robin returns the gun, passing along the message that Chandler should not shoot Batman again. MAD did a Peanuts parody of sorts telling about the Red Baron's encounters with Snoopy from the Baron's viewpoint. He came back from one flight grumbling that he'd emptied his plane's machine guns at "the Beagelhund" (yes, it's not correct German), then emptied his pistol, then threw the pistol. "He fetched it!" In Wreck-It Ralph, Calhoun throws her guns at some approaching Cy-Bugs after she runs out of ammo. 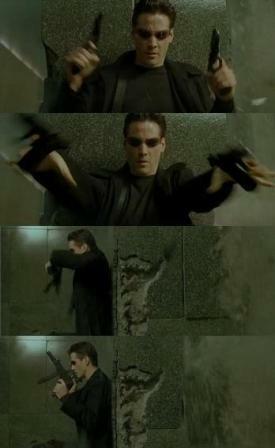 Used a few times in The Matrix, since the dozens of guns abandoned were conjured up from computer code, and vanish without a trace when the programmed reality is "reformatted". Neo and Trinity plan on doing this during their raid, since they correctly figured there would be no time to reload. In Skyfall, Bond uses an Anderson Wheeler double rifle for most of the attack on the eponymous estate, but upon running out of ammunition promptly discards the weapon. His contentious relationship with his parents may be part of his reasoning. The zombie horror/comedy Undead hangs a giant neon lampshade on this. The badass never reloads, instead whipping out a fresh pair of pistols after every barrage, to the point of ridiculousness. This goes unmentioned until he spends several minutes naked, finds new clothing in a thrift store, and at the first sight of zombies, whips two Desert Eagles out of Hammerspace, prompting another character to ask, "Where've you been keeping them, then?" In The Boondock Saints, Il Duce challenges all three saints to a firefight while wearing a waistcoat with six handguns. Each time a pair of handguns runs out of ammo he just drops them and pulls out another pair. The cops investigating after the fact reasonably assume that it had to be at least six guys with guns. Detective Greenly: What if it was just one guy with six guns? The Mummy: In the opening battle at Hamunaptra, O'Connell fires Guns Akimbo at a number of bad guys. He runs out of bullets... then drops the pistols, draws two more from their holsters, and keeps firing. The French service revolvers he was using were loaded via a gate at the back of the cylinder, like a Colt Single Action Army revolver, requiring much more time to reload than even modern revolvers. The Last of the Mohicans: Hawkeye and Chingachgook stage an extended two-man assault on a group of Huron. Because all of their weapons are single-shot, Hawkeye and Chingachgook repeatedly drop their empty muskets and pick up the loaded muskets of the Huron they'd just shot. Parodied in the 1985 comedy/adventure film adaptation of King Solomon's Mines. The female character throws a gun at the villain; he shouts: "Thank you!" and uses it to blast away at her. Unforgiven: Clyde carries three guns because he only has one hand, which makes reloading impossible for him. "I just don't wanna get killed for lack of shootin' back." Played straight, then lampshaded, then inverted in Grosse Pointe Blank — Martin Blank and rival hitman Grocer end up in a Mexican Standoff across a kitchen counter, only to find that they're both empty. They toss their guns away, and Grocer pulls out a fresh one while teasing Blank when it's apparent that he's all out — "So, what are you gonna do? You gonna THROW that gun at me? How 'bout this? How 'bout I sell you a piece for a hundred Gs?" Grocer tosses a loaded gun past Blank's cover and jumps out to shoot him only for Blank to smash his head with a nearby television and electrocute him. Jason Bourne in The Bourne Series frequently breaks apart and discards weapons he's used, including the hunting shotgun in the first film and the handgun in the third film's Waterloo Station fight, presumably to prevent people using them against him and/or delay forensics (though unless he were to make particular efforts to throw the parts away separately, this should only delay it by half an hour or so). In Joss Whedon's original script for Alien: Resurrection, one of the smugglers was supposed to carry plastic guns that were made to be disposable. In his final Last Stand, he was supposed to eject a number of pistols from his sleeves and discard them as they ran out of ammo. This aspect didn't make it into the final film (presumably because someone on the writing team realized the oddity of designing a gun to safely fire only one time) and the guy's sleeve pistols are presumably as reloadable as any other guns. Tremors: When a giant man-eating Sand Worm breaks into the basement of the Crazy Survivalist and his wife, they seize one firearm after another from their Wall of Weapons and blast away at the creature, which is only a few feet away — sometimes reloading, but other times tossing the gun aside and grabbing a more powerful weapon. At all other times in the movie the two show proper weapons handling; this case is justified in that they are right in their own basement, so they can just retrieve the guns after they've killed the worm. In Wanted, Wesley does this, during his major assault on the bad guy headquarters. Why reload your gun when you can take the guns from your dead enemies? Possibly parodied in the original The Blob (1958), when a four-year-old boy "shoots" the Blob Monster repeatedly with a cap pistol and then throws the toy gun away. Presumably he'd seen this trope in action on Superman shorts and cowboy flicks. Staff Sgt Nantz in Battle: Los Angeles runs out of ammunition for his assault rifle while chasing retreating aliens and reflexively lets go, draws his pistol and keeps on firing. Averted in the opening Car Chase of The Transporter when a French policeman empties his revolver after the protagonist's rapidly-departing car. The cop is about to throw down his gun in frustration, when he realises what he's doing and throws down his cap instead. The trope is played straight in later scenes though. Posse has a scene where the two combatants advance slowly in a Showdown at High Noon, attacking with Throw-Away Guns. Done justifiably by Buster Kilrain in Gettysburg. His wounded arm made it difficult for him to reload a rifle (and they were running out of bullets anyway), so he went up and down the line, grabbing rifles from the fallen, checking if they were loaded, and if they were, firing it before dropping the gun and looking for a new one. Shoot 'em Up. Clive Owen's character does this while carrying a baby or during a mid-air shootout — all other times he reloads. In the opening of The Shadow, gangster Duke, unnerved by the Evil Laugh of the title character, blasts away in all directions with his snubnose revolver, then tosses it aside to grab a Thompson submachine gun with drum magazine from his car. Subverted in Red when Victoria is exchanging fire with the Secret Service. Every time she runs out of ammo, she calmly exchanges her MP5K for another held by her colleague, who reloads for her while she's emptying that weapon. In Ultraviolet, Violet has hundreds of weapons stored in high-tech Hammer Space, so she just drops empties. Justified in the final chase in The Terminator, as the Terminator is on a motorbike and can't just reload like he's done on every previous occasion. Justified in the final battle of Commando, as John Matrix annihilates the Big Bad's army he just tosses his guns aside as they run dry. This is because he stole the guns and doesn't expect to keep them and that he really can just pick up more guns from the slain. While only seen once in Strapped it's implied that this is a common practice. One of the people purchasing a gun on the streets refers to it as a "burner" suggesting it can be disposed of after it's used. Used in John Wick: Chapter 2 as the basis for an entire action setpiece. Wick is up against an army of mooks with nothing but a single pistol with seven bullets, so he harvests new weapons from each fallen enemy as he proceeds. When running from Big Nick at the end of Den of Thieves, Merriman throws away his assault rifle. Justified as the rifle is out of ammo, and Merriman is looking to disencumber himself to make it easier to escape. The Dresden Files has Kincaid, who claims to be a perfectly normal hired mercenarynote he's actually — probably — half-demon; at least, he's written up that way in the RPG who's just very, very good at his job. In Death Masks, he produces a golf-bag full of double-barreled shotguns which he discards after firing one shell through each barrel, because said rounds are Dragon's Breath rounds, which fire a 20 foot plume of flame. He explains that this is hot enough to melt the barrel, so he can't shoot more than one through any given shotgun or else they'd explode. This is why those rounds aren't used very much in real life. Averted in the Jerry Ahern novel The Takers when the protagonist (an action novelist and gunwriter) is told to throw down his guns, he quotes from a Western. "I won't throw down my weapons, I'll set them down." In Tim Powers' On Stranger Tides, Hurwood assists the pirate attack by firing one pistol after another, pulling the guns from bandoleers and dropping them after use. Justified because Hurwood has only one arm and would be slowed down immensely if he paused to re-holster each weapon. Since they're aboard a ship the dropped guns likely aren't going anywhere. Justified in The Godfather. Michael Corleone is given a untraceable, unfingerprintable revolver and is told to just drop it next to the dead bodies. The reasoning is that, if Michael is caught at the scene, the mafia will be able to "fix" any eyewitnesses so that Michael can say he was just at the scene. However, there's nothing they can do if the murder weapon is found in his pocket. In The Shadow pulps, the Shadow is terrible about tossing away his automatics whenever they're empty. One reviewer speculated that the hundreds of empty handguns left by the vigilante might be the cause of New York's gun problem. Farscape. Crichton throws away his second pulse pistol after it too shortly runs out of oil (bullets) in the group's escape from the Peacekeepers on Arnessk. Happens a few other times too. A running gag is that any pulse pistol Crichton uses other than the one he keeps and maintains as his sidearm, which he calls "Winonna" will always jam or run out of oil during a fight, causing him to toss it and complain that Winonna is the only pistol he ever comes across that he can rely on. Due South: Once they cross over into Canadian territorial waters, Ray tosses his gun to Fraser because he is a much better shot. In the Firefly episode "War Stories", Zoe tells Wash "Six shots, then throw it away." as she hands him a pistol. Her husband is however inexperienced with firearms, so it would probably make more sense than teaching him to load in the short time they have. Lampshaded in an episode of How I Met Your Mother, Robin goes to a shooting range to cool off after breaking up with Barney. She is shown violently shooting at her target and once out of bullets, she actually throws the gun. In the second episode of Garth Marenghis Darkplace, Animate Inanimate Objects start attacking everyone, and Sanchez pulls out his gun and shoots the floating objects down. Then his gun tries to wrench itself around to shoot him, so he throws it to the ground, stomps on it, pulls out a second pistol, and starts shooting the first gun with it. Then he throws the second gun at one of the floating objects, and it spins around in midflight to chase after him. Played with on Sleepy Hollow. Abby gives Ichabod Crane one of her guns and after firing one shot he drops the gun. She pick the gun back up and angrily asks why he did something so stupid. Crane is from 1781 and no one has explained to him that modern firearms are capable of firing multiple shots without reloading. After firing what he thought was his only shot, he dropped the gun to look for something more substantial to use as a melee weapon. CSI: NY: Done by a perp in "Civilized Lies". He fires two shots at the cops, finds his gun empty and then discards it before trying to flee... and running straight into a third cop. Warhammer Fantasy Battle has a Regiment of Renown (a mercenary unit) of Dwarf death seeker pirates. They have a special rule, "Festooned with pistols", allowing them to use pistols in each turn of combat. The full-round reloading time in Hong Kong Action Theatre seems designed to encourage this among players, since many Hong Kong action characters will dump their guns once they're out of bullets and either draw or grab new ones to continue the gunfight or turn the situation into a kung fu battle. Seriously averted in Warhammer 40,000. No Guardsman would ever throw away their weapon unless it was too damaged to be usable. This is because Guard regulations state that losing one's weapon is a crime, potentially (and usually) punishable by summary execution. This is largely due to the rifle (and sometimes just the ammunition) being far more valuable than the guardsman who wields it. As a result of this, Guardsmen tend to take their rifles everywhere. Space Marines will only discard their weapon if they're killed, as they treat every bit of their equipment as a holy relic, to be treasured and preserved. Adeptus Mechanicus takes this one step further, sacrificing entire legions of troops to retrieve weapons that other people discarded centuries ago. The World Eaters believe a weapon destroyed or lost in battle brings bad luck, leading to this trope (and a lot of waste). Despite this, Khârn's chainaxe Gorechild was made from the remains of his primarch Angron's axe, when he destroyed its teeth by hacking his way out of a collapsed building. BattleTech has a few examples of this. For one, quite a few battle armor suit designs carry disposable missile launchers (one-shot models or with a small number of reloads) that are generally jettisoned after use to no longer slow down the trooper(s); indeed, normally jump-capable Inner Sphere battle armors equipped with those are generally prohibited from jumping until the missiles are expended or the launchers ditched. Optional rules expand this to disposable packs for other weapon types and also introduce explicitly handheld weapons for BattleMechs, which allow a 'Mech to carry weapons it normally doesn't have installed but also usually encumber it and block some to all of its 'standard' weapons fire; these can be dropped and picked up again as the occasion demands. Battletech's roleplaying game spinoff Mechwarrior features a number of small, cheap guns in its inventory. Some are explicitly one-shot weapons, meant to be expended and then tossed out due to the fact that they have no reloading options (and some of them are hideously expensive for disposable weapons). Alternately, some weapons in the game are so cheap and small that it's not unreasonable for a character to simply toss it once expended and pull a new one. Holdout guns are often in this category, such as the holdout pistol, a snubnosed 5-shot revolver heavily implied in the original material to be a "Saturday Night Special" type of gun. This explains its relative cheapness and the fact it can't seem to hit anything past 10 meters or so. Heavy Gear has the compact but convenient folding rifle known as the Deployable Pack Gun. It comprises of little more than a barrel and receiver on a hinge, a pistol grip, and an internally carried ammo supply...often with no ability to reload it in the field, as opposed to its clip- or magazine-fed ballistic cousins. As a result, some pilots just carry one with them for extra firepower in a pinch, expend the rounds carried in its internal ammo storage, then toss the entire gun once it runs dry to save weight mid-battle. This has led some pilots to call it the Disposable Pack Gun. The Liberator assault gun, which is an automatic shotgun meant for trading to warlords with untrained armies and has a sealed mechanism that is impossible to reload, so you may as well throw it away when empty (it doesn't even make a very good club). A self-assembling rifle, which is made of matter retrieved from another universe by nanomachines and, when empty, begins to degrade quickly. A whole section on "Idiot Guns", another invention for warlords with expendable, ignorant troops. These "guns" in particular are little more than an evolved claymore mine that one points roughly toward one's enemy, discharges, and then tosses, leaving behind a husk known as a "Chechnyan rose". Another section full of, effectively, 3D-printed or otherwise solid-plastic objects which have various parts of the plastic endowed with different qualities, from electrical properties to explosive, allowing automatic shotguns, pistols, derringers, machine-pistols, laser pistols, particle-beam rifles, and various kinds of grenade and rocket launcher (the mortar is mentioned in another section) which, upon emptying, will immediately proceed to dissemble themselves into a mess of environmentally-friendly organic chemicals of various appearance, consistency and smell (except the single-shot grenade pistol; that still ends up as a lump of molten plastic you need to dispose of). Even some of the melee weapons in the book are disposable, beginning with a bio-dagger which can be set to destroy itself after use and ending with a plastic sword which becomes uselessly blunt after a few blows, can't be sharpened, and may as well be tossed. This is the name of the game for those which feature a Limited Loadout; once you have all your weapon slots filled up, picking up a new gun requires dropping what you've already got. In the Uncharted franchise, Nathan Drake can only carry one pistol and one long gun. Whenever he swaps weapons, he simply dumps the previous one on the ground. In Assassin's Creed IV: Black Flag Edward Kenway does this with his pistols in the cinematic trailers. Justified by the type of pistol (single-shot muzzle-loaders), so it's easier to just toss them. It's impossible to actually do this in-game, however, since you can't discard any of your pistols. It is, however, possible to throw away any of the muskets he can pick up. Other player characters in Assassin's Creed can also ditch muskets that they pick up, starting with Connor in the previous game to Black Flag. If it counts, in earlier games it was possible for Ezio to pick up and use enemy weapons like spears that he can't normally keep on-hand and then drop them after the fight. Characters in Xenophobe can only carry one gun, so discarding your gun for a better one is important. Oddly though, you want to remember where your old gun was because guns have a tendency to explode when dropped and you might want to go back for your old one. In some versions you also get points for dropping your gun, which can lead to repeatedly dropping many guns until they explode! In the Metal Slug series of games your character ditches special weapons when the clip empties, reverting to your starting pistol. The few firearms available in the Dead Rising games are discarded when the fairly generous ammo runs out. Fortunately, you can fill your inventory with guns so the fun doesn't have to stop when your current gun does. You can do this with any gun-type items in the Super Smash Bros. games, and in fact have to once they're empty since there's no way to reload (and they will, notably, immediately disappear on contact with the ground when thrown after being emptied, whereas a still-full gun can be tossed several times). One cutscene in Mass Effect has Saren tossing aside his assault rifle and approaching to attempt to strangle Shepard. Other than that one scene, though, nobody ever drops a gun in the entire saga. The inventory mechanics require you to have one of every type of gun you can use (in the second game) or one of every type (even if you can't use it, in the first game) equipped. Mass Effect 3 makes heavy weapons into pickups placed on the map rather than something Shepard carries on his/her back as in Mass Effect 2. The heavy weapon replaces your equipped one until its ammo is expended, then Shepard drops it and goes back to the previous weapon. The Area 51 (FPS) and The Darkness use this in one of the circumstances where it's actually a realistic response — when using Guns Akimbo. Reloading two weapons at once is clumsy at best and impossible at worst, so the empty weapon really is just dead weight (though the realism of guns akimbo in the first place is specious at best). Although, in The Darkness, Jackie keeps hold of one pair of pistols, the custom ones that were given to him at the start of the game as a birthday present. They're always the last pair of guns he pulls out, so he must hang on to them and reload them at some point. In the Halo series, most Covenant energy weapons run from a power cell which humanity does not know how to recharge or replace. This leads to swapping guns with your dead enemies as a necessity, even sifting through the bodies to find the one with the most charge left. The same applies whenever you play as a Covenant Elite. Marathon has the alien weapon, which is new to humanity. You can't even tell how much ammo you have, let alone reload. Condemned: Criminal Origins takes it one notch further: it's an FPS that doesn't have a reload key. Even though you may wind up with one gun with 4 bullets in it in your inventory and another one with 3 on the ground, there is no way to top the first off with the ammo from the second (especially weird considering you can take the magazine out to visually note how many more bullets are in it, but you can't take those magazines out to slap them into another gun). You can keep ahold of the gun to use as a club once it's empty, but they're hardly effective at the role, dealing the least damage and breaking after a dozen or so hits. Thus, the CSI protagonist mostly relies on braining people with 2x4s, rebars, and lead pipes. The sequel allows you to reload your current gun with the ammunition from a weapon on the ground and in safes, or from one in your holster after the point in the game where you unlock that. Jurassic Park: Trespasser explains its non-reloadable as the heroine having a broken left arm. How she is able to fire an assault rifle on full auto one-handed, especially with any semblance of accuracy, is not. In Mirror's Edge, using a gun is not really the best way to play. Runners, like the player character Faith, use their agility and acrobatics to fend off attack. When carrying a gun, Faith's agility is hampered, depending on the gun size and handedness. A pistol retains your use of both hands (to climb and vault) but mildly hampers your acceleration and jump. Anything larger than that, like a rifle, does kill your ability to jump and vault and wallrun, and your max running speed is completely nuked. An M249 machine gun is the worst - you're forced to walk and you jump like a Goomba, if at all. Played straight and subverted in MDK2 with Max the four armed dog throwing away most of this weapons once he runs out of ammo, luckily there is always a good supply of guns lying around. Subverted as Max has four weak guns with unlimited ammo which never leaves his hands, unless he dies. Karen's higher level Flash Drives in Luminous Arc 2 consist in emptying a pistol, two submachine guns and a bazooka upon the target, discarding them once they click empty. In Dead to Rights, protagonist Jack apparently dislikes reloading guns. He can max out his ammo by picking up more of the same gun, but instead of putting in a new magazine, in true Hong Kong action style, he'll throw away his guns and pull out two new ones. If he's using a two-handed weapon like a shotgun or a submachine gun, he'll reload that, however. This is at least partially justified, however, as every enemy in the game will eventually shoot at him, and it's presumably easier for him to just throw away his gun and pick up another. Or violently disarm some guy and kill him with his own gun. Nick Kang in True Crime: Streets of L.A. can fire all Guns Akimbo, but throws them away at the drop of a hat; when entering a car, when entering a building, when attempting to holster. He always returns to his issue sidearms, which are also wielded akimbo, have unlimited ammo, and can get upgraded to deadly enough power to make the other guns superfluous. The guns in BloodRayne just offer another variation for killing, and are discarded by Rayne as soon as they're empty, or when other guns are picked up. In Scribblenauts, any weapon you create will have 1 to 5 shots, after which Maxwell will throw them to the ground... where they then turn into a puff of smoke. Alex Mercer from [PROTOTYPE] doesn't bother holding onto reloads for the guns he pilfers from the military, tossing the firearms away instead. Bayonetta goes through a casket full of guns in a single cutscene, apparently just because she felt like it: while they can't channel her magic as effectively as Rodin's handiwork, she's still able to give the final pair infinite ammo. This is arguably a partial justification for Cutscene Power to the Max; ruining the guns allows far more powerful shots which quickly pulp angels, versus the scaled-down magic bullets she shoots in gameplay at a "safe" level. In the World War II-based games in the Call of Duty series, the player is often forced to drop whatever weapons he started levels with for German ones most simply because, with rare exceptions, there's no way to replenish the ammo for the former without actively letting your allies die. It helps that, most of the time, The Enemy Weapons Are Better  after all, the Allies have no good parallels for the MP44 assault rifle or the FG42 automatic sniper. Modern Warfare has an example of this if you use cheats - when you're supposed to shoot Zakhaev at the very end, he will attempt to shoot back at you with his Desert Eagle. If you use god mode to survive his shots, after he fires seven times he'll drop the gun and pull out another one. Another seven shots from that, he drops it too, and then pulls out an M1911 with infinite ammo instead. Modern Warfare 3 also has a proper variation in a cutscene, where Grinch drops his rifle to pull out a pair of Deagles during his team's Last Stand because there's simply too many enemies and too much going on for him to reload properly. This also happens and is justified in one mission near the end of Call of Duty: Advanced Warfare. Mitchell's prosthetic arm has been broken, so the player cannot reload or throw grenades, and must throw away a gun after emptying its magazine. Alcatraz from Crysis 2 can pick up and wield heavy machine guns. When it runs out of ammo, he simply tosses it aside and goes back to using standard weaponry. Done in the 3D Grand Theft Auto games. As long as you have at least 1 bullet left, you keep the gun, but once you have no ammo you throw it away. This causes some annoyance if you want to buy more ammo, as you'll have to fork out for a new gun as well, though most of the time ammo is plentiful anyway. Done to full extent in Grand Theft Auto IV, where Niko dumps every empty weapon straight on the ground and pulls out a different weapon whenever ammo for that weapon in particular fully goes out. The following game in the franchise, Grand Theft Auto V, doesn't actually let this happen since the protagonists have infinite inventories and so, instead of dumping their guns away, they just keep it in their inventory until more ammo is acquired for them to be used again. Jagged Alliance 2 averts this one in theory, as it's possible to have your characters try and clear the jam, but it's surprisingly difficult to do so and each failed attempt costs Action Points.note Presumably this is because only really serious malfunctions are actually represented in-game, and simple misfires or failures-to-extract that can be cleared just by manually working the action are abstracted. In practice, you're usually better off switching to another weapon until the end of combat and patching it up afterwards. Reloading also takes more Action Points than just drawing your sidearm instead, but limited inventory space and the shortage of truly ambidextrous mercs make going the full Heroic Bloodshed route Awesome, but Impractical. Just Cause 2 plays with this trope a bit in its basic mechanics. When a gun runs out of ammo, if there are no other guns of the same type lying around, it is easier to pick up one of the other types of guns, which drops your current gun. Similarly, there is never ammo for any of the DLC special weapons, so once you are out of ammo, you either have to call in a weapon drop for it again, or toss it for something else in the area. The irony of tossing weapons comes in the form of the "mounted gun" which can be unmounted and carried around. It is "heavy" so you cannot run or jump while wielding it, but it has infinite ammo and can destroy anything you fire it at. The only reason not to have it all the time is that you can't bring it with you... so you might as well drop it when moving on. Team Fortress 2 has a Throw Away Weak Turret Gun. The Combat Mini-Sentry is a Fun Size version of the standard Sentry Gun that is unable to be upgraded. It also costs more metal to reload an empty Mini-Sentry than to just destroy the extant gun and build a new one. Once heavily damaged or emptied of ammo, it is always better off destroyed or left as a decoy than tended to and reloaded, unlike the standard Sentry Gun. Seeing as how Sentries are effectively the primary weapon for The Engineer, this means that he is therefore constantly throwing down, then throwing away scores of small automated guns. Mann vs. Machine mode has an upgrade that allows the Engineer to build a disposable sentry gun—which is, for all intents and purposes, a combat mini-sentry. Your regular sentry gun is completely unchanged, so it is very well possible to build two mini-sentries if you have the Gunslinger equipped (not like that will do you any good in MvM). In Deus Ex there is a small disposable plasma gun called the PS20. Intended as a stealth gun with its small profile, the size of the gun limits it to a single shot, although for some reason you can only carry one at a time and even a headshot at point-blank range won't kill someone. There's also a much larger variation with the Light Antitank Weapon, which has the same limit of one shot and only one in your inventory, though it's much more powerful (and also takes up much more space) since, as the name suggests, it's meant to be used against armor rather than people. One Finger Death Punch has throw-away bows; once you use up your arrows, your character drops the bow and keeps fighting, even though it could theoretically be used as a melee weapon. The game, however, is modeled after wuxia movies, and using bows as melee weapons violates most of the genre's style rules. Reaper in Overwatch "reloads" by dropping his guns and pulling another identical pair out of his trench coat. There is also D.Va's MEKA suits, which are treated as disposable and contain a Self-Destruct Mechanism for offensive use. A new suit can be called down fairly quickly to replace the prior as each gets destroyed. The notoriously bad Drake of the 99 Dragons has "master assassin" Drake reload his akimbo handguns... by pulling out another pair from Hammer Space. And since he doesn't wear gloves, this results in him leaving guns with his fingerprints on them wherever he goes. In Syphon Filter: The Omega Strain the player can choose what firearms to bring on a mission. Unless they choose guns with the same type of ammunition as the enemies they encounter, this trope can happen when the player runs out of ammo and has to discard their weapon and scoop up an enemy's. In the cinematic trailer to Brink, a Resistance heavy empties an assault rifle and just lets it fall out of his hand before reaching for a shotgun stuck to his back. In Agents of Mayhem, Kingpin discards his current gun and teleports a new one to his hand instead of reloading. He also tosses his gun away whenever he gets into a car. Oda Nobunaga in Fate/Grand Order loves More Dakka, but since she uses slow reloading single-shot muskets, she makes up for it with lots and lots of guns. Downplayed in Max Payne 3, where Max's loadout is limited to two handguns and one long gun. While the handguns get shoulder holsters for him to stash them in when he's not using them, the long gun is simply held onto by its foregrip when he's not using it; thus, going Guns Akimbo with pistols requires him to drop whatever long gun he currently has. MAG-ISA: Eman and Kyle both ran out of ammo as they engaged in a firefight. When they did, they just threw out those guns (at least Eman did) and proceeded to knife fight. When the title doctor confronts Franz Rayner, Rayner opens the battle by firing a full magazine at the Doc. When the Doc dodges all the bullets, he throws the gun — as a distraction, considering the next panel is the Doc getting punched in the face. A variant occurs here — after King Radical's chainsaw is jammed by the doctor's broken sword, he tosses the chainsaw at the doctor. The Alt Text for that comic states "Every weapon must be thrown once it has exhausted its initial usefulness." Hank in Madness Combat tends to go through guns and ammo at an amazing rate. This never holds him up too badly, though, since he resupplies himself from slain Mooks. For some reason, he prefers to take the least-sensible weapons available - given one dead mook with an axe and another with a never-fired AK-47, he'll take the axe. Why does he not take the gun when given the choice between that and an axe? Because he's a badass, that's why. Youtube channel The Gun Collective frequently plays ads for their sponsors at the start of their videos. One of their ads for Acceptable Targets has very tongue-in-cheek visuals including this trope as seen between 0:15 and 0:45 here . 1532. If it's cheaper to buy a new gun than reload the old one, there's a problem. Elisa in Gargoyles is lucky she's a detective who (as is often the case in the U.S.) is allowed to use her own personal firearm and not a standard issue one supplied by the department. Otherwise, she'd have to awkwardly explain the loss/destruction of at least three of them to angry superiors in the NYPD over the course of the show. The Venture Bros., "Escape to the House of Mummies, Part II": A mook throws his empty gun at Brock and is admonished by a fellow mook with "I have more bullets ya know. You gotta stop doing that. Now go get it!" Improvised firearms in general, such as zip guns, paltiks and paliuntods. They are usually either too impractical to reload or too dangerous to use after a certain (usually single-digit) number of rounds shot because of the wear of the barrel and chamber. Often they are used only as initial weapons in order to rob or loot decent firearms. The World War II-era FP-45 Liberator and the Vietnam-era Deer Gun were one-shot pistols designed to be mass-produced and distributed to freedom fighters in occupied territories; they could be reloaded, but the process was so time-consuming that it's been frequently joked it was faster to build another one. As above, the idea was that you'd shoot a soldier and take his weapon to continue the fight. The legend of Blackbeard (real name Edward Teach) going into battle with half a dozen loaded guns on his belt may well have been true — but hardly uncommon. In the days of single-shot muzzle loading ball and powder pistols, and even as late as the 1850s, in the age of slow muzzle-loading cap-and-ball revolvers, it was quite common for gunfighters to wear bandoliers of preloaded guns in order to fend off numerous foes in heated firefights. This was done in order to avoid the lethally time-consuming (and unreliable) procedure of reloading one's pistols in the heat of combat. Usually, though, combatants would tie the guns to their belts so that they were not completely lost when dropped. Some missile launchers and recoilless rifles are designed to be discarded after firing, like the Panzerfaust , M72 LAW, AT-4, FGM-148 Javelinnote The Javelin is actually half this trope and half a regular, reloadable weapon; contrary to how it works in a lot of games, the launch tube is thrown away, but the Command Launch Unit it attaches to is not, Miniman, Apilas, and FIM-92 Stingernote another odd example in that it can actually be reloaded, but it's primarily designed to just be thrown away after use. Instructors sent to train the Afghan National Army have reported that even supposedly experienced men were all too prone to respond to a jammed weapon by throwing it away and looking for a replacement - and running away if one was not forthcoming. Contrary to portrayals in movies such as Enemy at the Gates, the Soviets at the Battle of Stalingrad did not have weapon shortages. Quite the opposite, in fact: while weapons were plentiful, ammunition was scarce, sometimes a mere 5 rounds per soldier. Once this ammunition was expended, it was not uncommon for the rifle to be abandoned. From the same war, this was what led to the Sten submachine gun's existence and the reason that it used the same bullets as and close copies of the magazines for the opposing MP40 - in mid-1940, British forces in the European theater were forced to make a hasty retreat back to their home territory, and left a lot of guns behind. While replacing their domestically-made Lee-Enfields and Bren guns would not be very problematic, their SMG of choice had primarily been American-made .45 Thompsons, which would have been much harder to replace as America was gearing up for war themselves, and the only pistol-sized rounds manufactured in Britain before then were rimmed revolver cartridges that couldn't have been used in an automatic design at all. In comparison, 9x19mm ammo was abundant after forces in the African theater managed to capture several million rounds of it from surrendering Italian forces. A slight variation of this in real life is called the "tactical transition", where a shooter allows their primary weapon (such as a carbine) to drop while wearing a sling and immediately switches to their pistol. They are not discarding their primary weapon as it is still hanging from them by the sling. This is only really used when someone absolutely needs to keep shooting immediately (such as covering a buddy while he is in mid-reload). Example . The Scottish tactic known as Highland charge involved running at the enemy really fast, shooting muskets at 60 yards while on the run (mostly to create a smoke screen rather than hit anything) then drop the musket to switch to a Claymore. Despite being consumate professional soldiers with an appreciation for superior firepower, Gurkhas tend to prefer their kukris for close-in work. Gurkha units had a reputation for throwing away their rifles in the last few yards of a charge - and having to go back to retrieve their dropped rifles after the battle - at least as late as WWII. In the infamous 1997 North Hollywood shootout, bank robber Larry Eugene Phillips Jr, fired at the police with a fully automatic rifle until his rifle suffered a "stove pipe" jam. The jam would have been easy to clear, but Phillips ditched his rifle, a shot to the hand earlier rendering him unable to clear the jam, and fired at the police with a Beretta pistol (ironically a 92FS, the same type issued to the LAPD officers he was shooting at) until took another round to his firing hand, at which point he picked his gun back up and shot himself with it.note Most sources go with this version, at least; some say the suicide was an accident, a result of trying to pull the slide back with his chin during an attempt at reloading. For what little it ended up being worth, Wikipedia also claims he took a hit from one of the police, which severed his spine, at the exact moment he shot himself - and even if that wouldn't have killed him, the police apparently continued firing on his body for several seconds after he stopped moving. This practice in real-life is known as the New York Reload, which involves a person switching to a secondary firearm, rather than spending the time to reload or clear a malfunctioning firearm. It's named for policemen in and around New York, who in the days when police used revolvers would carry two or more on their person, and in a shootout would drop or otherwise put away their first gun when it was empty and pulling out their second one to keep shooting. This largely fell out of use after police forces started updating to 9mm automatics like their respective militaries, since on top of the doubled to tripled capacity of a revolver, the detachable magazines of an automatic could be swapped in and out about as quickly and easily as one could toss a revolver and draw another one (and replacing magazines that are lost or damaged from being freely dropped is a lot cheaper than replacing a gun entirely). Pistols manufactured by Hi-Point have the stigma of being of very low quality in most firearms circles, due to the fact they cost less than most other polymer framed guns made by bigger names like Glock or HK and are largely made of softer, inferior metals and cheaper steel (compensated by using a lot of it in their construction, resulting in a very chunky, brick-like profile). Naturally, a joke exists in these same circles that the "proper" way to reload one is to throw the gun in the general direction of the attacker.